News & Events Seminars Danny Brothers, Ph.D. Ongoing studies in the Lake Tahoe Basin (LTB) and Salton Sea are aimed at understanding earthquake history across submerged and active faults. In the LTB, a suite of marine geophysical data (sub-bottom CHIRP, sidescan sonar and multibeam bathymetry) and piston cores were used to define the timing and magnitude of the most recent earthquake on the West Tahoe Fault. However, surveys revealed an ancillary, but fascinating discovery. A group of submerged, upright trees were discovered and radiocarbon dated to ~1250 AD. Dendrochronology of wood samples and water balance calculations suggest the LTB experienced severe, multicentennial drought during medieval times. Similar methods were applied in the Salton Sea, California, where the San Andreas Fault (SAF) terminates and transfers strain across a series of short, extensional faults to the Imperial Fault. The southernmost SAF has not ruptured in over 300 years and is considered ‘overdue’ for a large-magnitude earthquake. To understand the hazards in the region, we collected >1,000 line-km of seismic CHIRP profiles in the Salton Sea to define the sedimentary and earthquake history along the submerged faults. Our observations suggest faults in the Salton Sea can potentially generate M6-6.6 earthquakes every 150 years or so, which could act as stress modulators on the southern San Andreas Fault. Furthermore, based on the relationship between Holocene flooding surfaces and fault displacements, it appears that some ruptures are synchronous with Colorado River floods into the basin. Flooding increases both the vertical load and pore pressure on faults making them more inclined to fail. 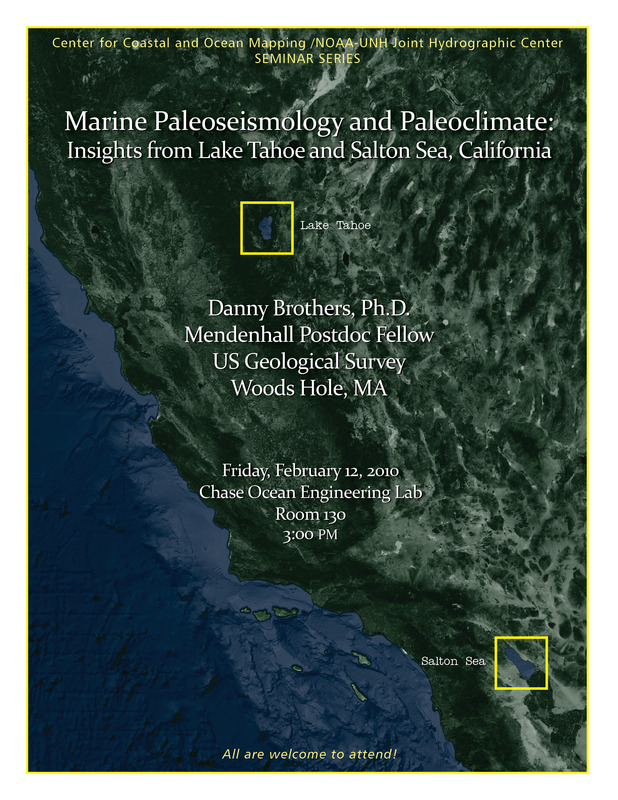 Danny Brothers is a Mendenhall Postdoc Fellow for the US Geological Survey at Woods Hole, MA.